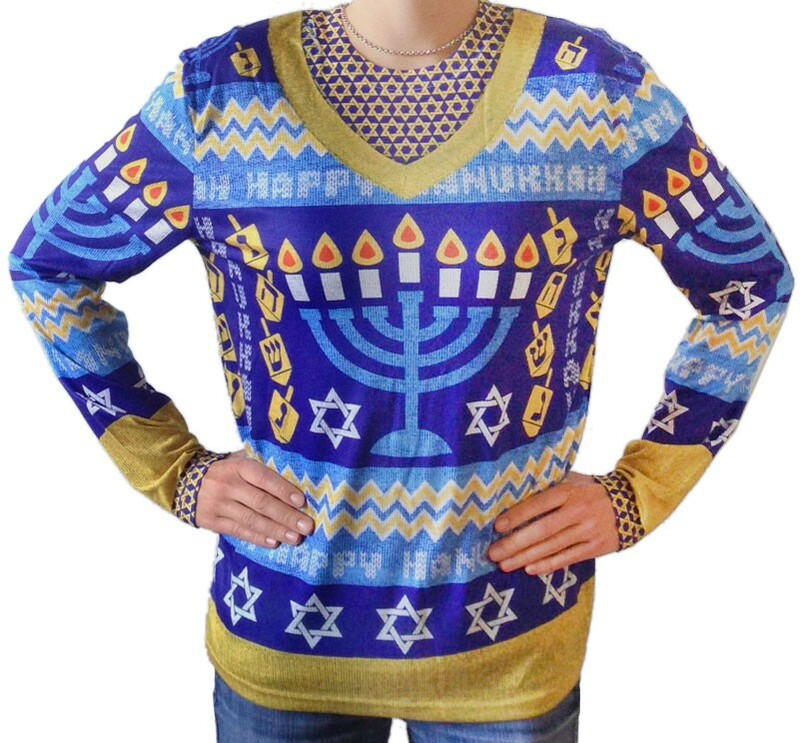 Ugly Hanukkah Sweater and All the Holiday News That Isn’t 2014 | Whad'ya Know? -Hottest Christmas toy this season for boys anything Minecraft, for girls anything they say it is. -Starting a new tradition, President Obama will pardon the Christmas ham. -Those of you spending Christmas in Japan, remember Christmas Cake means sponge cake, but also may mean any unmarried woman over 25. -Denmark claims sovereignty over the North Pole, but assures children everywhere Santa Claus will be grandfathered in. -Duggar Family Christmas cards–well, at 14 x 48 foot, billboards, really–have been sent out, but gotten so pricey the list has been cut way down. -Your neighbor’s Christmas lights are visible from space. Upside is any alien invasion goes next door. -This year hot holiday clothing means the Ugly Chanukah Sweater, featuring a menorah that runs from wrist to wrist when you hold your arms out. -Gloria and George ‘Buddy’ Witherow of Symrna, Tennessee, have 50 themed Christmas trees in their ranch house, including the Bob Hope Tree of Golf, a Noah’s Ark tree with 2 of every kind of ornament, and the deck the boughs with Elvis jumpsuits tree. -Psychologists say that people with blow-up Christmas lawn ornaments are an entirely different type. -Governor Scott Walker makes up for his ‘molotov’ gaffe by lighting the giant Magilla in the Wisconsin State Capitol . . .
That’s All the Holiday News That Isn’t–Season’s Greetings to You and Yours! This entry was posted on December 18, 2014 at 6:48 am and is filed under Uncategorized. You can subscribe via RSS 2.0 feed to this post's comments. Hi admin do you need unlimited articles for your site ?